Home/Learn/What is Bush Regeneration?/What is a Weed? A weed is a plant growing where it is not wanted. Any plant, including ferns or algae can become a weed. Weeds pose a threat to the environment, can adversely impact on human or animal health or cause crop or stock losses. Of the many thousands of plants that have been brought into Australia only a small proportion have become weeds. These plants are usually tough and adaptable. They are able to germinate and grow in a variety of conditions, producing lots of long lived seeds that spread readily or can spread rapidly by vegetative growth. Weeds and garden plant escapes are regional. What may be a problem in one area, or even one state, may not be so in another. Plants introduced from other parts of the world, as well as plants of Australian origin moved beyond their region, can pose a threat to the long-term health of our environment. This occurs because there may be a lack of the natural influences that keep a plant in check or the conditions prove ‘too good’ and growth and/or reproduction becomes rampant when compared to that plant’s natural habitat. They often have the ability to out compete native plants by the speed and bulk of their growth, as well as destroying habitat for animals. Weeds can spread by seeds, bulbs, suckers and other parts of the plant. They can infiltrate and damage bushland irrespective of distance as seeds and other parts of plants can be spread by wind, the movement of soil & water and by animals. Vehicles can transport plants and people can carry seeds on clothing. Some weeds can establish in untouched bushland. However many do best where there has been some disturbance already. So weeds may not be the main cause of damage in an area and may be the symptom of much bigger problems like stormwater run-off or changed soil. When thinking about controlling weeds it is very important that all the things happening in an area are looked at first. Why are the weeds there? Removing weeds without fixing up the underlying problems may make things worse. 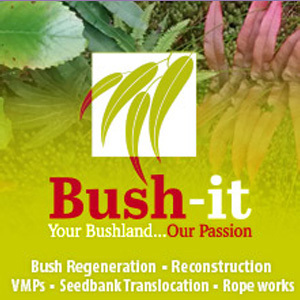 Remember that Bush Regeneration is much more than just pulling out weeds. Weeds can have positive benefits on a site. They may be great habitat for animals, eg lizards and frogs living amongst Tradescantia. Larger weeds like Lantana may be crowding out or oveshadowing much worse weeds like Madeira or Ehrharta. Some weeds can act as a ‘nurse crop’ providing shelter for native seedlings in the early stages of their growth. Once established weeds can difficult and expensive to control or eradicate. For more information on weeds use this link to the ‘What is a Weed?’ section. There are some guides to weed control techniques on this page.